Your hounds have come too soon. The wind whistled still, but now it was the only sound. Then there was silence, followed by smiles and sighs of relief in the old farmhouse high in the wild hill country where roads are few and houses fewer. But Gareth's face was grave. "It’s not yet over", he said, "they’ll return at midnight and if we can’t match them rhyme for rhyme they’ll be in the house and round the table and the feast will be theirs". "But what...?" said Eleri, her voice trembling between fascination and fear, "...what was that horse-head shape in the window?" "Hush child" said her mother, not wishing to speak of such things on this night. But Gareth said, "If we are to keep this house intact tonight we must all be aware of the powers we face." He sat down in the fireside chair and was silent for a while, but the others knew he was thinking deeply. Meanwhile Rhiannon went to the fire, knelt in front of the flames, and spoke softly the blessings of the hearth and prayed that they would all be safe and well that night. When she had finished she beckoned the others to join her. They sat around the hearth and waited. Gareth spoke of the powers of the night and the revels of the dead, though others said they were never living. But whoever they were they came with a pack of hounds and many rhymes, and only a rhyme could keep them out. 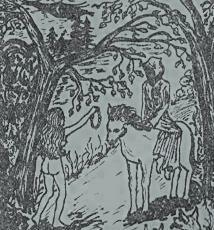 When they came, so too came the Mari - the Grey Mare of the Night - and only she can tell the rhymes to match them with. Then Rhiannon went to the shelf and took down a book and began to read the story of her namesake. There was a penance: that she should carry on her back anyone who came to her at the horse block that stood outside the gate of her court and who required carrying into the grounds. Rhiannon put down the book and said "By she whose name I bear and my place in this household I will go and make our peace with the night". She went upstairs and took off the dress she had worn for the feast and every other piece of clothing and ornament save only her necklace of things gathered over thirteen moons many years ago. She wrapped a black cloak around her nakedness, went downstairs and for the second time that night she knelt in front of the fire and asked a blessing of Bride at their hearth. Then she turned to Gareth and they spoke a few words before embracing. After this she unbolted the door and went off into the night. Soon she was wandering through the grey mist and there came a shape that was greyer still. Rhiannon stopped and spoke to the shape, but the shape did not reply. Then Rhiannon discarded her black cloak, took off her necklace and held it out to the figure before her. The figure became clearer but glowed like an old moon in a watery sky: it was an ancient mare carrying an old woman in a black shroud. And the woman said "You did well to discard that cape my dear" and Rhiannon recognised the cape as the shroud on the woman's back. "Now won't you give my mare a rest?" she sighed, stroking the ghostly grey head beneath her. "Gladly" said Rhiannon, I will carry you wherever you wish to go". Then the old woman came to her and embraced her and the rain rattled through the trees and the wind blew her tears away and the grey mist cleared and there was only darkness. As Rhiannon wandered through the darkness, hopelessly lost, a line from the story she had read earlier that night ran through her head: "But it was chance that they would permit themselves to be carried." As she remembered this the waning moon shone through a gap in the clouds and she recognised a copse of trees which stood near the farmhouse. Soon she could see the warm light of the fire and the lamps showing through the windows. She arrived home naked, wet and spattered with mud. The others looked troubled as she came through the door. But without pausing to warm herself or explain what had happened she put on a coat and led each of them out of the house, one at a time, and made them learn a verse with her while the wind sang around their ears. Gareth was wise in lore and learning and made his verse with little help but with the firm grip of Rhiannon's hand in his. But others had the fear of the night on them and had to be held long and close before the verse came, and Eleri she held closest of all as she made the words she had to say. We can hear the bottle's clink. And take your food and drink. Go now to the deep dark night. And as she put the necklace around her neck once more the sound of howling dogs faded into the distance and even the wind was still. The fire blazed up brightly as she returned to the hearth and gathered everyone about her for an embrace and they thanked Bride for her warmth and light, for their firm grasp of the verses and for the love they shared. Merry was the feast and snug the bed throughout the night though the cold wind blew outside through the bare trees and there was a hard winter ahead of them.